Recent data from the Bureau of labour Statistics’ “Employer Costs for Employee Compensation” (ECEC) survey can shed light on this issue. According to the ECEC data, workers’ inflation-adjusted average total compensation per hour increased by 1.3 per cent per year from 2000 to 2009 (from $26.23 per hour to $29.39 per hour in 2009 dollars)1 However, the annual growth rate of average wages and salaries during this period was much lower. More specifically, if one subtracts out the employee share of health insurance premiums2, workers’ average hourly wage and salary compensation increased by just 0.7 per cent per year from 2000 to 2009. 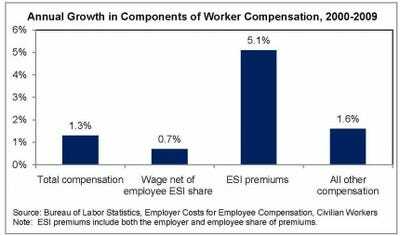 As shown in the following figure, the corresponding growth rate in ESI premiums (including both the employer and employee share) was much higher at 5.1 per cent per year. As a result of these very different growth rates, the fraction of workers’ total compensation going to employer-sponsored health insurance premiums increased from 7.4 per cent in 2000 to 10.3 per cent in 2009. If the growth rates in both workers’ average total compensation and in employer-sponsored health insurance premiums remain at their recent rates, this share will increase to 15.0 per cent by 2019 and will continue to increase thereafter. Thus in the absence of reform that slows the growth rate of costs, a steadily increasing share of workers’ total compensation will be eaten up by health insurance premiums. The increase from 2000 to 2009 in the average share of workers’ total compensation going to ESI premiums is even more striking when one considers that a steadily declining share of workers and their dependents are covered by ESI. More specifically, according to the most recent data from the U.S. Census Bureau, the share of non-elderly adults and children covered by ESI fell from 68 per cent in 2000 to 62 per cent by 2008. This decline was to a large extent driven by a decline in the fraction of firms offering ESI to their workers, which fell from 69 per cent in 2000 to 60 per cent in 2009.3 Thus if one focused only on those firms that offered ESI during this period, the trends outlined above would be even more striking. These trends, along with recent empirical research4 on this issue, make clear that increasing health care costs are reducing the wage growth of American workers below what it otherwise would be. The President’s Proposal for health insurance reform would genuinely slow this growth in costs, allowing workers to enjoy more of the benefits of their productivity increases in the form of higher take-home wages. 1 These data are for the first quarter of 2000 and the first quarter of 2009. 2 The ECEC survey provides data on employer expenditures on ESI premiums. However, for most ESI plans, employees also contribute to the premium, thus effectively reducing their take-home wages. According to data from the Kaiser Family Foundation, the average employee share for single coverage increased from 14 per cent in 2000 to 17 per cent by 2009. During that same period, the average employee share for family coverage increased from 26 per cent to 27 per cent. Taking the unweighted average of the single and family share in each year yields an estimate of 20 per cent in 2000 and 22 per cent in 2009. One can then multiply the average amount spent per hour by the employer on ESI by 0.250 (the ratio of 0.20 and 0.80) in 2000 and by .282 (the ratio of .22 and .78) in 2009 to estimate the average amount spent by employees per hour on their ESI premiums. This average hourly employee ESI contribution is then subtracted from the hourly average wage and salary value. If one does not subtract out the employee ESI contribution, the annual growth rate in average hourly wage and salary compensation from 2000 to 2009 is similar at 0.8 per cent, with average hourly employer costs for ESI premiums growing at 4.8 per cent per year. 4 Katherine Baicker and Amitabh Chandra. “The labour Market Effects of Rising Health Insurance Premiums.” Journal of labour Economics, 2006, 24:3.